Last week’s announcement of the discovery of a Samnite tomb in Pompeii was a good indication of how much material (both pre- and post- Roman) there is still to find in the ancient city. Whilst many of us eagerly await further excavation and the scientific analysis of what has been unearthed thus far, there is one thing that will never be known about this woman: her name. The Samnites rarely, if ever, marked their graves, and certainly not with the kind of durable stone inscriptions that are found all over the Greek and Roman worlds. But this is not to say that the Samnites (or other Italic peoples) didn’t have written language, or an epigraphic habit. The survival of Oscan texts in Pompeii is actually quite significant considering that the last of the language and the people who used it were subsumed under the Roman umbrella in the first century BC. Oscan was one of many Italic languages used in the Italian peninsula prior to the dominance of Latin. It first appears in written form on coins dated to the fifth century BC. An Indo-European language, it borrowed elements of both the Etruscan and Greek alphabets, forming a text that was written from right to left. The Pompeian inscriptions in Oscan were first published in Emil Vetter’s Handbuch der Italischen Dialekte (1953). More recently, a three volume collection edited by Michael Crawford et al, Imagines Italicae, comprehensively compiles the evidence for Italic languages from across the ancient world. Volume II contains the material from Pompeii; 147 texts in all. Some are too fragmentary to transcribe enough to translate or identify, but those that are complete include names on pots, terracotta moulds, tiles, stamps, amphora, and dolia, graffiti on exterior walls of houses, and monumental lapidary inscriptions, most often recording building works. Traditionally, these texts have been primarily used for two purposes: to understand the administration of the city in the periods before the Social War and between the fall of Pompeii and its official colonization nine years later, or to trace the involvement (or lack thereof) of indigenous families in politics through the Roman period. There have also been some attempts to use the Oscan inscriptions as evidence for a resurgence Italic nationalism in the first century AD, but this has largely been discredited by Crawford and McDonald. Other mustering points and commanders named in these notices include a meeting point between the building of Ma. Castricius and Maras Spurius, where V. Sextembrius commands (Pompei 4 = Ve 25, found between VII.6.23 and VII.6.24), between tower 10 and 11 where T. Fisanius, commands (Pompei 5 = Ve 26, located between VI.12.8 and VI.12.1), and by the domus publica near the Temple of Minerva (Pompei 6 = Ve 27, on a doorpost between VIII.5.19 and VIII.5.20). The majority of the Oscan texts that survive are dedications and commissionings of building works. The majority can be attributed to local magistrates, but one is, perhaps surprisingly, the result of the actions of one of the consuls of Rome. Despite being sixty some years prior to Roman colonisation, the consul Lucius Mummius, who presented gifts of looted booty to various cities after the sacking of Corinth in 146 BC, chose Pompeii as the recipients of one such award. A statue base in the Temple of Apollo, covered with plaster in antiquity, records the gift. Another text was recovered from the Temple of Apollo, dated to circa 140 BC, which records the construction of flooring leading into the cella of the temple. This inscription is slightly unusual, as it is formed from the use of small stones laid directly into the flooring at the threshold. A similar medium, a pebble mosaic with text, was found on the ramp leading to the Temple of Dionysus. Ú(vis) epidiis ú(vieís) tr(ebis) meziis tr(ebieís) aídilis. Located about one kilometer from the amphitheatre, the Doric temple at Sain’ Abbondio, dated to approximately 250-200 BC, also houses an inscribed altar with an identical Oscan text on both sides. M(a)r(as) atiniís m(a)r(aheís) aídíl suvad eítiuvad. Other building works recorded epigraphically include road works beyond the Porta di Stabia (Pompei 13 = Ve 8), a sundial in the Stabian Baths (Pompei 21 = Ve 12), a small tholos above a well in the Triangular Forum (Pompei 11 = Ve 15), a portico (Pompei 9 = Ve 13), honorific dedications of one sort or another (Pompei 18 = Ve 20, Pompei 24 = Ve 11 et al.) and a variety of building projects that cannot be identified. The biggest problem with the Oscan inscriptions is that many of them were re-used as building material in antiquity. Thus, the original location or structure indicated in the text is lost. An excellent example of this comes from the Porta di Nola. This limetone slab, now housed in the British Museum, was used in the construction of the gate, and appears to have already been broken / damaged when it was inserted into the archway of the gate, near the keystone, and was covered with plaster. Its location renders it highly improbable that the inscription was still meant to be read, much less was actually legible in situ. 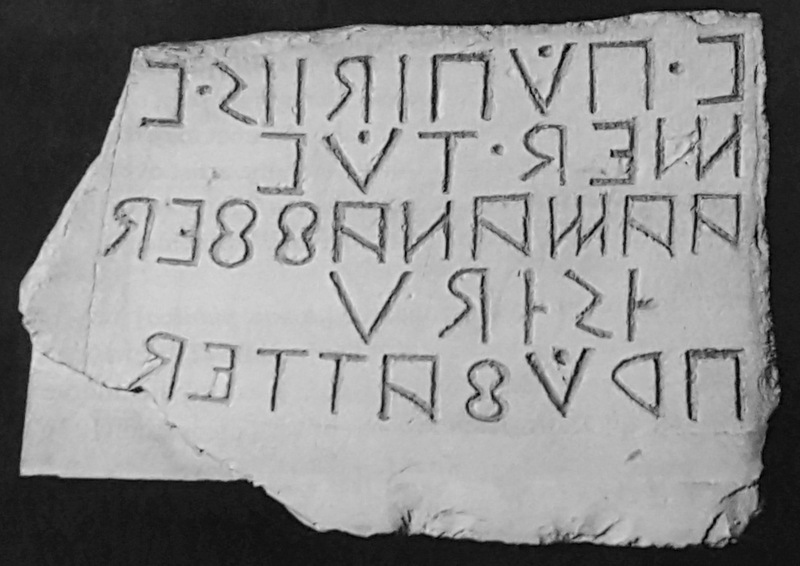 The re-use of Oscan inscriptions demonstrates the fundamental fact that the language was more or less obliterated with the influx of Latin. That the Romans cared little to preserve the earlier texts is incredibly frustrating for someone like me, but understandable in the context of the ever-expanding empire of the first centuries BC and AD. Even when structures, such as the mensa ponderaria (Pompei 27 = Ve 22) which originated in the Oscan period, were maintained, alterations were made: both the measurement cavities and the text were re-formed to Latin standards in the Roman period. Regardless, the Oscan inscriptions that remain demonstrate that the epigraphic habit was hardly just a Roman one, or one that was introduced to Pompeii with colonisation. Despite the initial non-urbanised culture of the Samnite people, the evidence shows that city life, and recording its civic activities, was not limited to any one Italic population. Perhaps the best example of that comes in a final series of texts, graffiti, found around Pompeii. There are at least eight abecedaria (Pompei 74-81), which, if we view them as the Latin versions are interpreted, demonstrate children (or adults) busy learning their language. To my mind, there is little else that can illustrate the importance of Oscan in pre-Roman Pompeii so well. love your posts! i can add a very minor bit of possible info of Oscan in Pompeii. i volunteered on the AAPP dig in 2001 and dug at the so-called “Soap Factory” in the NW part of the city (i think it was Regio 6, Insula 1, building 15 or 16?) anyway late in the dig i unearthed a circular metal piece, roughly 4″ wide with lettering running around the perimeter of it. One of the characters was a backward “R” that someone mentioned was an Oscan letter. took a photo of it (pre-digital) but unfortunately it came out blurry. i assume the piece sits now somewhere in a storeroom on site. I missed you by a few years… I dug with them in 1998. I’m sure there are a lot of bits and pieces that have Oscan text that have never been catalogued properly. Any ideas what the piece was?